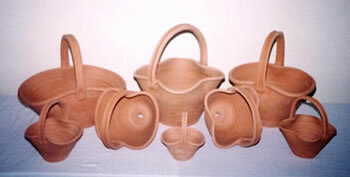 Baskets are a popular and unusual planter. 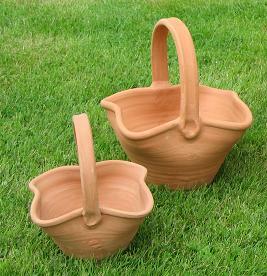 Larger baskets are ideal for the garden or driveway and small versions are ideal for windowsills. All sizes have good space for planting and are an excellent pot for showing off brightly coloured annuals or spring bulbs. 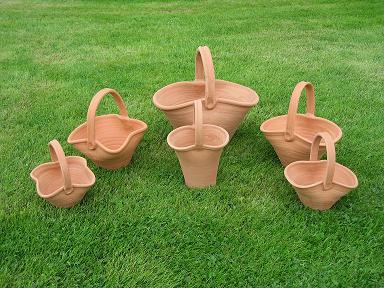 An ideal garden ornament, available in 4 sizes, small, medium, large and extra large. An unusual garden ornament, which looks lovely, planted out with colourful flowing plants. Clover leaf baskets are available in 3 sizes, medium, large or extra large. This new range of baskets are taller and tapered to give an elegant appearance. Once again they are ideal for showing off brightly-coloured annuals and flower arangements.